Named after the town in Washington state in which the company was born, Yakima have developed a tailored solution to your load-carrying needs. Folks in that part of the world love – and live – the outdoor lifestyle. 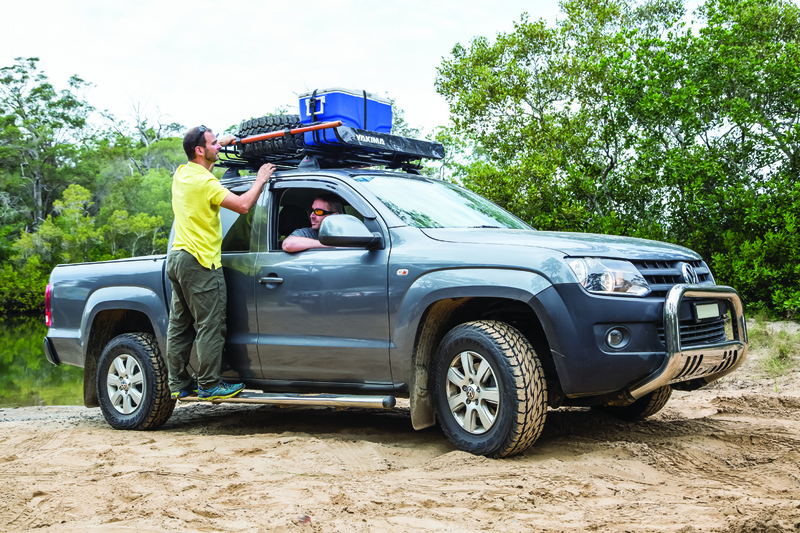 The good news for us is that Yakima branched out and over to our corner of the globe and combined their outdoor expertise with Aussie engineers to design a premium, rugged roof rack specifically for the Australian lifestyle – they’ve even built bottle openers into the bar legs. Now one could say it was presumptuous of Yakima to assume we’d ever use the bottle openers, but who are we kidding? It may also come as a surprise that the bottle openers aren’t the only feature worth taking notice of on the LockN’Load heavy duty rack system. If you’ve ever driven a vehicle with a roof rack, then you’ll have heard the siren song of wind whistling past the bars. Along with noise pollution, roof racks also have on their rap sheet reducing fuel efficiency and raising a vehicle’s centre of gravity, which is no good thing if you plan on driving on any uneven terrain. LockN’Load racks have an aerodynamic airflow diffuser ridge that not only looks the part, but is designed to minimise noise and reduce drag, which in turn should keep your fuel economy from dipping too low. The wide base and low height of LockN’Load’s heavy duty legs keeps your gear close to the roof, because rule number one when loading up your vehicle is to keep the centre of gravity low. Heavy gear should be kept in the car and only the bulky but lightweight items like swags should go on the roof rack. Another feature we thought was worth a second look was the integrated tie down points, which saves you the hassle of having to buy eye-bolts. 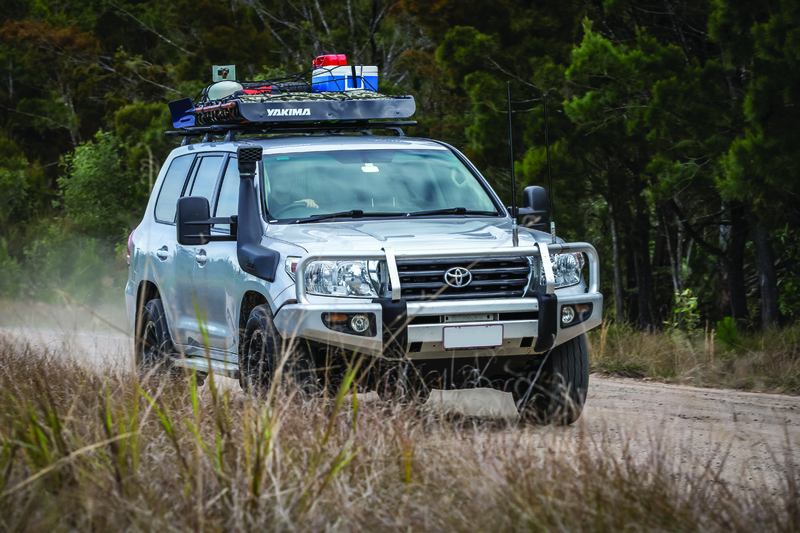 Rather than take the ‘one size fits all’ approach, LockN’Load roof racks are purpose-built for specific off-road touring vehicles, while still being customisable and versatile. Check out their website to see which design best fits your 4X4, so you can get your gear out of the car and fit more friends in it. Prices range from $380-$735 depending on your vehicle’s specifications. For more information, click here. Hopefully the author was assuming that ‘kept in the car’, meant in a wagon or a ute and modified to carry heavy items such as fitting fridge slides and tie down points, etc. I can’t believe that the person who penned this article has had any safety training to do with vehicles. The article states that ‘all heavy gear should be kept in the car’. Heavy items such as boxes of equipment, food and esky’s can turn the interior of your vehicle into a blender, with the occupants being badly injured or worse. if your vehicle rolls and/or are in a serious collision the weight of every item multiplies many times . Interiors of vehicles do not have tiedown points designed to secure a thirty kilo esky full of drinks. Wrapping a seat belt around a box will do little to stop missiles flying around in the vehicles interior. I have seen the results of a Pajero rollover at speed with a seventy year old occupant being hit in the head by an unrestrained bottle jack that was sitting on the rear floor. if he had been hit by an esky the result would have been fatal. anyone know the difference between seem and seam. You have a SEAM in a dress sewn by a seamstress where two pieces of material are joined together. There may be times when you SEEM to be a bit sad that you are working instead of camping. I recently purchased some of your lock and load bars. VERY disappointed I have owned rhino vortex bars and areo bars wouldn’t know thay are there. Yours sound like there is a frieght train on my roof VERY DISAPPOINTED AND ANGRY. interesting comment, I fitted ‘heavy duty’ Rhino bars to my Ranger. At $350.00 + for 2 of them, they are strong but do not include the bolted onto roof tracks, and are horrendously noisey, in fact, I used a noise metre in the cab and the wind-noise with the racks on was louder than the vehicle was under full acceleration, both tested at 100 KPH. I wrote to Rhino to ask for some ideas or assistance to remedy the situation in a positive way, and received o reply at all, rang them and just got passed around the phone system and then finally cut off, TWICE!! I am hoping that the Pioneer Platform on the Backbone mounting system is better if anybody has any info on that I would love to hear.